It has only been a week? Time has flown by here in Ramallah as there is lots to see and do and plenty of work to get started on; yet it is hard to believe that we have only been here for one week as we have done so much in a short amount of time, and it has been easy to settle in. It seems that the word we need to know the most here is ‘shukran’, which translates to thank you, as what immediately became apparent upon arrival is that the people living here are extremely welcoming and try their hardest to help us when needed. We spent our first day in Ramallah exploring the markets, which were initially overwhelming due to the hectic atmosphere, but locals repeatedly shouted “Welcome!”, so straight away we had a sense of the friendly community. The buzzing spirit in the markets emphasises the way that despite living under the occupation, the people here admirably keep up morale and maintain normality in their daily life. Had it not been for the instant contrast from the smooth, wide roads of Israel to the narrow and rocky roads of Palestine after crossing the check point, the negative impact of the occupation would not be apparent at first sight in Ramallah. Despite the West Bank not being as built up as Israel in many ways, it is a shared opinion amongst us that the scenery here is beautiful and we never tire of taking pictures. Trying local food has also been a highlight, having not tried falafel before coming here, I could now probably eat it for breakfast, lunch and dinner daily! With many more places to visit, it will be difficult to resist overspending in order to make the most out of this opportunity. Our team is lucky enough to be here throughout Ramadan, so we get to experience the restaurant shutters coming up at night, and people going into town to break their fast. There are also lights decorating the city so the atmosphere is similar to Christmas in the UK. The extremely friendly and welcoming community is epitomised at Iftar, as local volunteers stand by the side of the road and hand out water to cars driving past, ready to be drunk when the call to prayer resonates in the evening. Some of the team have begun vlogs of their different experiences of Ramadan, and it’s safe to say that the UK volunteers attempting to fast are struggling! As already mentioned, during the first month here our team at Sharek has the opportunity to experience Ramadan in Ramallah. The lack of energy means working hours are shorter, and the summer holidays means that skill sessions cannot be run so we are focusing on continuing the Voice of the Youth project during our time here. Despite our initial feeling that perhaps there may not be that much to do, there is still plenty of project work to be getting on with and an enthusiastic attitude amongst us. We are continuing the People of Palestine project from the last cohort and are in the process of planning a summer camp for children aged 9-12. This is to give families a break from their children as not all children fast, and will enable the children to improve their English through games and other interactive activities. Each of us also have other projects – both the in-country volunteers and some UK volunteers are fasting and some are vlogging their different experiences of Ramadan so watch out for those. We also have trips to look forward to such as to Al-Qud’s university in Abu Dis, the only university to be surrounded by the wall, so we can continue to hear and spread the message about the negative impact of the occupation on young people. Meeting and working with in-country volunteers makes this experience even better, as we can learn more about different lifestyles and opinions on the occupation. We are all enthusiastic about getting started, and hope that the remaining 9 weeks don’t go by as fast as this first one! We have been volunteering with ICS for 5 weeks now and are in middle of our placement. This has been one of the greatest opportunities that we have had the privilege to be a part. Since the 30th of March we have been lucky enough to deliver session to students from 6 different universities from all over the West Bank. These sessions have had a focus on employability skills and English skills helping to build the students’ confidence while speaking English. International service organised an event for Volunteer Recognition Day at Al-Quds University giving us the opportunity to hear from volunteers here in Palestine. We were about to learn from their experiences which gave us further insight into the challenges faced by young people in Palestine. The aim of finding a job and succeeding professionally are challenges faced by us all, yet the problem in Palestine is compounded by the pressures and problems caused by occupation. 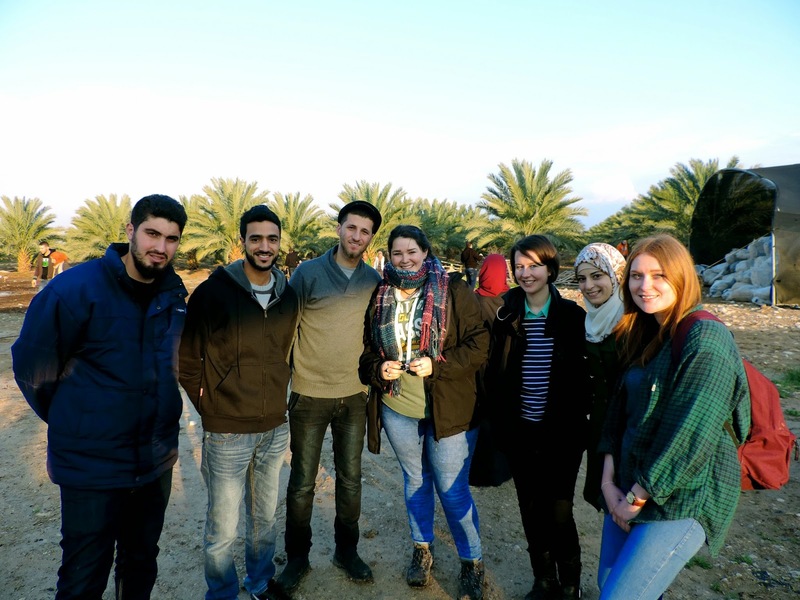 By volunteering with ICS, all of us - UK volunteers and Palestinian - have learnt so much both about each other, and about ourselves. The ability for us to work in a team made of people who have such different backgrounds and knowledge has been an enriching experience and has strengthened the bond between us. This has helped the team through the ups and downs of the project so far. Working in Palestine has at times been frustrating with some sessions being cancelled the night before. There have been times where we have prepared sessions lasting a length of time and on the day of the session we found out that the length of time we had for the session had been halved. The challenge of the in country volunteers balancing volunteering full time and university -particularly at this time of year exams and assignments- has been a learning curve which will no doubt be a useful skill for us in the future. For the next 5 weeks our project is changing, the universities we work with are about to break up for summer so the employability sessions are coming to an end (for now). The coming five weeks will see us working with a local women’s college with students from refugee camps around the West Bank. We will be delivering sessions designed to help develop the student confidence and proficiency with English. The next 5 weeks will no doubt throw up more challenges and experiences that will help all of us to develop and better ourselves, and we look forward to it! An insight into the West Bank from the eyes of an International. An overwhelming feeling of total immersion has so far been the stand out experience of the West Bank, an area of the Occupied Palestinian Territories. From clouds rolling low over the surrounding hilltops, to clouds of smoke creating curtains within the plentiful coffee and shisha shops, wherever you are, the essence of what it means to be Palestinian is unmistakable. “Welcome! Welcome!” or “What is your name?” or “Where are you from?” are the sentences most often heard in the market of Ramallah. From this, the friendly and approachable nature of the people is very noticeable. It’s a place that’s impossible to understand from the outside. Previous ideas of what it is like here are immediately cast aside, as even those who think they know what it’s like, don’t. The disparity displayed as you first drive or walk through the Qalandia check-point creates a feeling that is almost impossible to forget. Smooth tarmacked motorways change to rough uneven roads. Carefully arranged houses separated by decoratively placed palm trees change to a higgledy-piggledy selection of buildings, and lights with fruit and veg spilling onto the street from the front of local shops. Resistance is ingrained deeply in everyone here, and takes many different forms. “The IDF don’t just kill us physically, they aim to kill our minds. That’s what I won’t let happen”, Osama, a 24 year old from a refugee camp in Bethlehem explained. Osama is a member of the Freedom Theatre based in Jenin Refugee Camp, a cultural resistance project that has blossomed into a college for drama students from all over the West Bank. The inspiring forms that the resistance to the occupation takes, are a breath of fresh air from what is published and available for the international audience. The longer you spend inside the walls and the more you embrace the locals, the more you learn about the inspiring and resilient nature which citizens here must maintain in order to keep their culture alive. Wherever we live, the belief that we are all humans is key. It is easy to cast negative aspersions on what people who live under occupation are like, but that could not be further from the truth. Living in the western world we have the luxury of making the choice to be politically aware, however here that is not the case. Resistance is as much a part of their everyday lives as popping to the pub might be for us, yet this does not mean their lives are miserable. It’s a different way of life that’s for certain, yet when you get past the cultural and religious differences, the occupation and normalization of it, what stares you in the face is not dissimilar from when you look in the mirror. It’s been an exciting week for Team Voice of the Youth here at Sharek. We’ve settled in to our new home and started enjoying the local café culture. Our project is the most open-ended and self-motivated of the projects ICS volunteers are undertaking here in Palestine, a fact that was initially extremely daunting as we had to work out what direction we wanted to take things. Finding some structure where there wasn’t any was our first challenge, but after a week of discussions, plan writing and research we’ve devised an action plan! Our aim throughout this project is to promote Palestinian issues to the international community; the people who have a real chance and the power to change the situation in Palestine. Being here has made us all realise that something needs to be done to change the circumstances of the Palestinian people, and the most promising source of that change is pressure from the international community. That starts with us! We have an ongoing project that the previous cohort of volunteers left for us and we really want to continue. The Voice of the Youth #PeopleofPalestine project involves introducing individuals from all over Palestine, along with a picture and quote, to help change negative perceptions of Palestinians abroad. We are following new leads in writing articles about different aspects of the occupation and how they affect people’s lives. Issues surrounding access to education and minority rights will be the focus of several articles. We are also producing a #PeopleofPalestine series and accompanying article on The Freedom Theatre, in Jenin, which we visited. This inspirational project, which as survived against the odds, aims to promote non-violent cultural resistance against the occupation through theatre, film and photography. Their production is coming to the UK soon… keep your eyes peeled! Another exciting project we have in the pipeline is the production of a video, to be played at a World Health Assembly youth summit for AFI Changemakers at the United Nations in Geneva, on issues concerning access to medicine in Palestine. It is strange that as we just get started, one of our team is coming to the end of her time volunteering at Sharek. Our team-member Ruba is leaving us. As we take stock of our first impressions, I ask her what hers were when she first began here. This is good news for me and my colleagues, as we’re really hoping that I’ll pick up some Arabic while I’m here. We are part of the second cohort of UK and Palestinian volunteers who will be working together, delivering skills sessions with the Sharek Youth Forum. The UK volunteers have been working in Ramallah for three weeks now and it is abundantly clear that the skewed portrayal of Palestine in the western media fails to align with the reality on the ground. 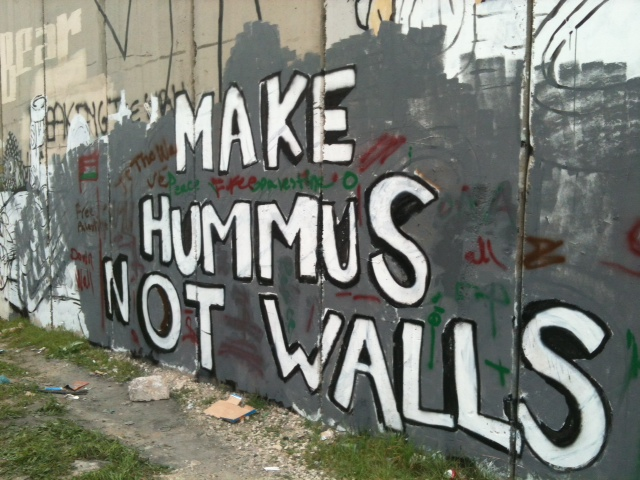 Ramallah is a bustling, cosmopolitan and incredibly friendly place to live. Whether visiting the satirically named ‘Stars and Bucks’ café for an Arabic coffee or frequenting the Mexican Bar ‘Fuego’ for happy hour, the local people are very hospitable and have been pleased to welcome us to Palestine. The UK volunteers and in-country volunteers have enjoyed meeting each other and exploring their respective cultures. We have found our new working environment offers a combination of passionate and open minded people in a positive atmosphere; we feel very lucky to be able to experience this journey together. We have talked openly and inquisitively about cultures, relationships and even religion. The good thing is that we can share anything without expecting to be judged. With regard to our work, given that the unemployment rate amount young Palestinians stands at over 40%, we have spent much of our time during the first three weeks planning and devising a programme of skills sessions relating to the broad subject of employability skills. We have delivered our introductory session to students from Al Quds University as well as travelling to Tulkarem and Hebron and have been delighted with the feedback so far. We used these sessions to find out more about the specific areas the students would like to work on and were not surprised that the overwhelming majority wanted to focus on their English language skills. It has been great to meet so many enthusiastic young people and we are all excited about progressing with the workshops. Away from the office we have spent time travelling around the West Bank with trips to the old city in Jerusalem, a tour of Banksy’s notorious work in Bethlehem and a marathon bike ride in Jericho. A particular highlight came with a visit to the Freedom Theatre in Jenin where some of us were lucky enough to attend the performance of their latest production; The Siege. In the face of massive adversity (the founder, Juliano Mer Khamis, was murdered outside the theatre in 2011) the project has continued to thrive. It was inspiring to see their powerful message delivered first hand; using the arts as a catalyst for social change - generating a peaceful, cultural resistance to fight against the occupation. The programme has given us all the unique opportunity to visit many places in Palestine that even the in-country volunteers had never had the chance to visit before. With lots of ideas, stimulating workshops and travelling to come, we’re looking forward to continuing the success of the project here at Sharek! Final thoughts: Breaking down stereotypes and myths with humour and Kanafeh! During our first week here, a member of our team received a message from a friend back home asking how she was settling in. This message then went on to ask the obvious questions, how we were finding wearing a burka, whether we actually had a building to live in and how we were obtaining milk each day. She was amazed to hear that we were not only wearing our normal clothes, but that we were living in a flat with heating and running water and had a supermarket just up the road from us, from which milk was easily obtained. We are now reaching the end of our three month experience in Palestine, so rather than just rounding up what we have been doing out here, I thought I would address some of the preconceptions that we (and our friends and families back home) had about Palestine before we arrived and how and why they have been challenged. The Western World has a very much skewed portrayal of what life looks like in the West Bank, if you Google image ‘The West Bank’, after you scroll through the plethora of maps of the West Bank (apparently people are really confused as to where the West Bank even is), you come across photos of the wall, protestors and warfare. In fact there are only a handful of pictures that don’t demonstrate this. If you were to surmise life in the West Bank by Google’s response, the West Bank looks like a constant warzone. However, what we have experienced here has been something completely different. We have stumbled into a country with some of the world’s most hospitable people, breathtaking scenery and the most amazing Kanafeh money can buy. This is not to undermine just how horrific the occupation is, or to say that the West Bank is a safe and content region. It is anything but that, the gauntlet of Israeli armed soldiers that a visitor has to pass through into the West Bank is a testament to that and the complete matrix of control that the Israeli’s hold over Palestinian everyday life further demonstrates this. Although the occupation is a constant battle for the Palestinians, it doesn’t individually define them; there is a relatable human side to this complex region. The biggest obstacle that I personally had to overcome before coming out to Palestine, was persuading my friends and family that I would be safe out here, and that I wasn’t in fact purposefully endangering my own life. The opinions that my family hold on Palestine is a testament to the role Western media plays in formulating incorrect ideas about the West Bank and harmful stereotypes. For them, I was entering a war zone, where I’d be subjected to daily rocket attacks and living in a country that was dominated by Muslim extremists. The reality is very different. Daily life in the West Bank occurs like it does in any country or city, people go to work, drink coffee, socialize with friends and have, what a lot would consider, a normal day-to-day life. The occupation restricts these activities in every way possible, yet the Palestinians carry on and resist. For example students’ travel to and from school and university is restricted, there are 59 permanent checkpoints in the West Bank and 243 flying checkpoint put in place per month by the Israelis, yet the Palestinians emphasize the importance of education and attend school daily, despite the obstacles they are forced to overcome. The resilience of Palestinians who face daily adversary is incredible. We held a class last week on stereotypes and the media, we split the class into two groups, one group brainstormed British stereotypes and the other focused on Palestinian stereotypes. When the group fed back on British stereotypes we heard the usual ones, tea drinkers, sarcastic, traditional. But then a few new ones came up, racist, lack of compassion and the Balfour Declaration was a recurring theme. I immediately thought of my friends and family back home, none of whom I would consider slot into these categories. But then I thought about Britain’s role in the occupation, and I was not surprised that they had formulated these stereotypes about us. But that’s the problem with stereotypes; they tend to tarnish everyone with the same brush. However, what was even more shocking was the stereotypes they were convinced we had on Palestinians. Terrorist was overwhelming the top hit; uneducated, impoverished and undeveloped all came a close second, camels and bad time keeping was also thrown into the mix at some point. Worryingly, these weren’t too dissimilar from the preconceptions that many of our friends and families had on Palestine before we came out here or the stereotypes that are often disseminated in the media. Last Wednesday we visited the Tent of Nations farm just outside Bethlehem, the farm is surrounded on all sides by 5 illegal settlements. In the face of continuing legal battles and violence from settlers and the IDF, the owner still maintained a positive outlook life, and non-violent resistance; he is trying to do something positive even in a dark political context. For him there is still life in Palestine, there is sports, music, art and laughter, but none of this is disseminated in the Western Media, we only ever read negative portrayals of Palestine. 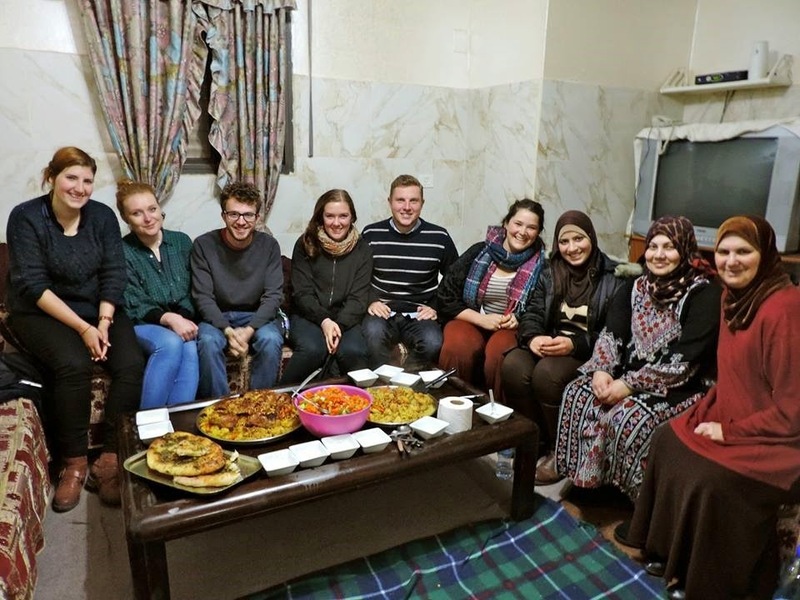 Spending three months with us has challenged and changed our students preconceived opinions about British people, and the stereotypes they previously had; it is this same reversal of opinion that I want to achieve back home for them and other Palestinians. If anyone had told me before coming here, that a day wouldn’t go by where I didn’t cry with laughter, I would have seriously questioned their sanity. Yet without wanting to sound like a cliché, I actually am sat here writing this whilst the room is echoing with laughter from my Palestinian friends. When I return to the UK I will encourage everyone and anyone who speaks to me about my time in Palestine to come out here and challenge the stereotypes for themselves. To come and visit this beautiful country, meet its incredible and hospitable residents, and witness their resistance to the occupation will challenge any of your preconceived stereotypes of Palestine. It is only through visiting yourself that you can challenge what the Western media and your friends and family portray as Palestine. But don’t take my word for it, come and see for yourself. So here we are, over half way through! With all of our capacity building sessions planned we've been focussing on meeting with people about Voice of the Youth and building the project's links with Palestinian NGOs. We've had some really valuable meetings and since Jenni gave such a wonderful account of the people of Palestine in our last post, I thought I'd tell you more about some of the Palestinian organisations we have encountered and their work. 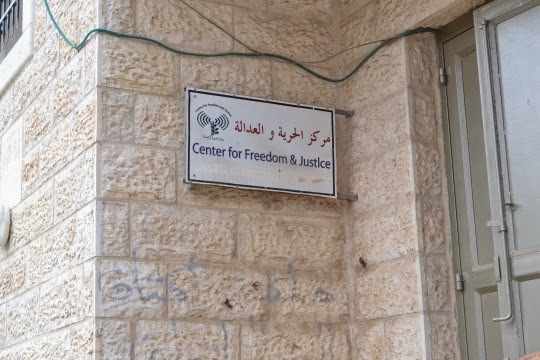 Last week several of us travelled to Beit Ommar, a town 11km north of Hebron, to visit the town's Centre for Freedom and Justice. Beit Ommar is surrounded by six illegal Israeli settlements to which it has lost thousands of donums of fertile agricultural land through expansion and improper disposal of waste. 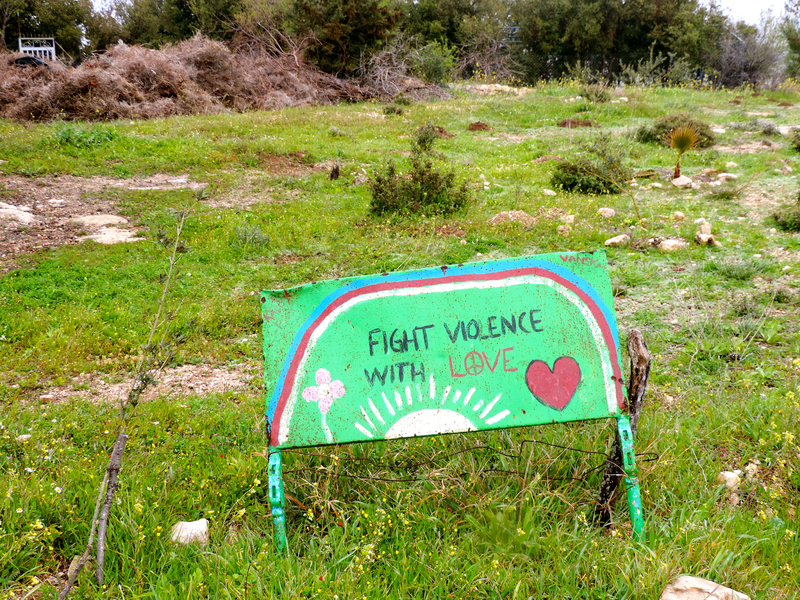 The centre works with farmers to reclaim land, and to engage the local community in acts of peaceful resistance. We met with Muna, the centre's director, to discuss their work and to ask her expert opinion on some key issues. In particular we were interested in the centre's projects for women and how women engage in peaceful resistance, as we're working on a Voice of the Youth video on the subject. The meeting gave us lots to think about for our video, but also helped us gain an insight into the impact of the occupation on the community in Beit Ommar. In a town where youth unemployment is a major issue and residents are regularly subjected to abuse from settlers, it was inspiring to visit an organisation dedicated to strengthening the local community and resisting occupation in the face of considerable challenges. We were given a culinary master class by the amazing Islam, who welcomed us into her home and showed us how to make delicious bread with za'atar and famous Palestinian maqluba. We had a wonderful time learning how to make traditional food and about the lives of the women in the group. Far from conforming to what most people's ideas of a refugee camp would be, the visit proved to be just another example of the endless Palestinian hospitality and openness. More recently, we visited Addameer Prisoner Support and Human Rights Association, the leading Palestinian NGO that supports Palestinian political prisoners held in Israeli and Palestinian prisons. Addameer provide legal aid and advocacy for prisoners, as well as documenting violations of prisoners rights and campaigning for change. We were distressed, though not surprised, to hear about the conditions Palestinian prisoners are kept in by Israeli authorities. Arbitrary arrest, the absence of due course in trials and detention conditions that violate human rights are all routine experiences for Palestinian prisoners. The meeting gave us some idea of the systemic injustice faced by Palestinians living under occupation, and has certainly encouraged us to think of ways we can continue to advocate for the Palestinian cause when we return home. Aside from our meetings we have been busy delivering capacity building sessions to our brilliant Tamayyaz groups and even starting to think about our handover to the next cohort (sob sob). We've decided to create a Voice of the Youth board of editors to make sure the project is truly where it belongs, i.e. in the hands of young Palestinians. To this end, we've begun recruiting Tamayyaz students to work alongside the next batch of ICS volunteers as VOTY editors. With so much talent and enthusiasm in each of the Tamayyaz groups we know we're going to have an amazing editorial team, and are already excited about seeing where they take the project when we leave. We've also sent our first Voice of the Youth monthly newsletter, and are coming up with even more ways to promote the project and grow its audience. Half Way There: Sheep, Goats and Lots of Food! Week 3 at Sharek, Settling in and Starting up!